Trademark owners and future entrepreneurs: If you want to grow your business, you should invest in your trademark. Think about it, what do you use to communicate with your customers when you’re not there? What is what they look for when they are seeking a product or service? What communicates to your customers the quality or reputation they have learned to trust? It’s your trademark! It is very common for business owners to neglect investing in what distinguishes them from their competitors, but this is not where you should be cutting costs because trademarks are assets. Essentially, trademarks are a property asset, similar to real estate, that can appreciate value, be bought, sold, licensed and used as a security interest to secure a loan for your business. Other intellectual property such as patents and copyrights have set expiration terms but trademarks are like vaults (or piggy banks) on steroids, they can last forever and can hold an immense quantity of value. As a matter of fact, your trademark can become your business’s most valuable asset but in this competitive and globalized era, you need to be proactive to achieve this. Otherwise, your trademark will become vulnerable to attacks from competitors, deemed to be abandoned by courts and you could even be forced to stop using your trademark. .• Register your trademark in all of the international classes that are closely related to your goods and services in order to receive adequate protection. • Register not only the words but also the design (logo), and if applicable, the slogan, domain name, sound, scent and trade dress. • If you sell or intend to sell your products or services outside the US, register your trademark internationally. • Register your trademark with Customs and Border Patrol (CBP). If you sell goods, this is important because the CBP examines cargo entering the country and can prevent the importation of goods that infringe registered trademarks. • Give notice – Once registered, use the trademark registration symbol ® to give proper notice to others of the fact that your trademark has acquired federal trademark registration. 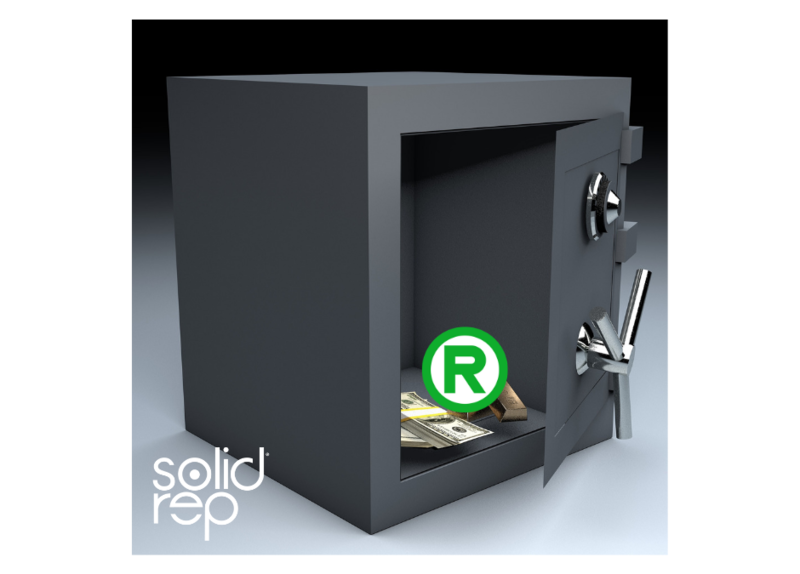 Please be aware that it is a violation of federal law to use the ® symbol prior to registration at the federal level. However, you can use the ™ symbol before you file the federal trademark application and during the application process to inform potential infringers that you are using the term or design (logo) as a trademark. • Continue using the trademark – If you don’t continuously use your trademark, bear in mind that it can be deemed abandoned because trademark rights are based on usage. • Use it properly – Develop trademark use guidelines and provide training for your employees. Marketing materials should be consistent and distinguish the trademark from the surrounding text. • Avoid Genericide – Use your trademark as a proper adjective and include the generic term of the product or service to avoid losing your trademark rights. For example, when you look at a box of KLEENEX, you will see “tissues” next to the brand name. Sure, you might think that this is redundant because who doesn’t know that KLEENEX are tissue papers? But this is actually a prime example of protection against genericide. • Be organized – Keep track of the maintenance deadlines of every trademark registration in order to pay the administrative fees and submit the necessary documentation to keep them alive. • If you find a confusingly similar trademark, have your trademark attorney analyze and confirm whether there is potential infringement. Be sure to have her counsel you on the proper steps to take, so that you can enforce your rights. Please bear in mind that a cease and desist letter should never be sent without proper evaluation of the facts. • Empower your employees and ask them to notify you if they see trademark misuse or a confusingly similar trademark in the marketplace. There’s strength in numbers, it’s good to have eyes everywhere. • Watch the trademark registration databases and the marketplace for potential infringement. Trademark owners have the legal responsibility to police their trademarks and enforce their rights. • Oppose the registration of infringing trademarks before they reach the marketplace. • Keep accurate records of all of the time, effort and money invested in marketing your products and services connected to your trademark. This will come in handy when you have to defend your trademark and your lawyer will thank you. • Save copies of the trademark availability searches, cease and desist letters, trademark use guidelines, informal communication with infringers and any other data that could serve as evidence of your enforcement efforts. • Document instances of consumer confusion. • Domain names – Buy the domain name bearing your trademark. But don’t stop there, buy domain names with important keywords to your business, common misspellings (typos) and any other term you wouldn’t want a competitor to own. However, don’t buy domain names of registered trademarks because this is an illegal practice (if done in bad faith) called cybersquatting. • Build a website and redirect those domain names you bought to drive more traffic to your site. Remember to use your trademark properly on your website. • Open social media accounts for your trademark on popular social media networks and on those visited by your target market. As I said before, remember to police your trademark! Major social media sites like Twitter, Facebook, and Instagram have their own unique policies on handling trademarks as it relates to usernames. As you can see, trademarks are awesome. Hopefully, you will have gotten more enthusiastic about harvesting the power of your trademarks after reading this. Note that a few of these tips are DIY but for the sake of your business, consult with a trademark attorney to develop the strategy that fits your unique business needs. This is a specialized area and every action or inaction carries consequences. Trademark law is complex and continuously evolving; in this article we’ve just scratched the surface. Remember, invest in your trademark, it’s your number one asset!